The guayabera, a favorite style from the Caribbean and Central and South America, is updated with travel-friendly details like a sunglasses loop and utility pocket big enough for a passport. The soft 100% cotton men's shirt has traditional details like vertical alforza pleats. The shirt is available in black, indigo, olive and white. 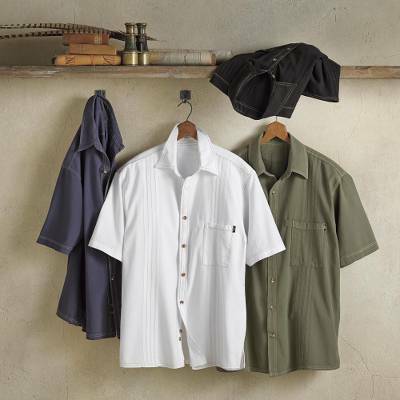 You can find men's cotton shirt 'Island Guayabera' by National Geographic in clothing categories such as Cotton Shirts. Enjoy exploring these sections for other Novica treasures. "This shirt is going to be a summer party regular"
The shirt washes up and dries well. I wore it to a block party on the the 4th of July and got several positive comments. I will be returning this item. When it arrived, it had a medium brown colored cardboard tag or label ( approximately 2" X 4") hanging on the front of the shirt near the top two buttons. The brown had faded onto or had stained the shirt fabric in perfect image of the cardboard tag. I don't know if the tag was wet when it was attached to the shirt or if it became damp in shipping. Either way, the shirt is not suitable for wearing. Now I have to go through all the bother and expense to return the item and wait for a refund. I'm very disappointed. "Another Great Addition to My Guayabera Collection"
The Peruvian cotton is so soft to go along with the expert tailoring. Great cruise-wear. My wife now wants one! I?m a regular NOVICA shopper & when I saw the opportunity to shop these very good looking guayaberas, I jumped on the opportunity. The shirts are nicer in my hands compared to the picture of the shirts. I?d previously purchased a long-sleeve guaybera & i was very pleased with that purchase. Highly recommended.
" Product ID: 301833 Send to a friend Island Guaya"
Island Guayabera in Large, black with cream stitching was beautiful! My husband wears a plain cream or darker tee shirt under it and looks and feels great! Heavier cotton, longer length and a bit boxy/lose fit which he wanted for our trip to Greece. We will see how it stands up to hot/humid temps and laundering! Great shirt, would by again, another color! "Excellent for a clothing snob...."